Fiji’s Ambassador to China Manasa Tagicakibau with staff of Fiji Consulate General at the launch of the Fiji National Pavilion at the China International Import Expo in Shanghai, China on November 6, 2018. The launch of the Fiji National Pavil­ion in Shanghai, China would help Fijian exporters, to sell their prod­ucts and services to the millions of Chinese consumers. The launch ceremony was held on Tuesday, during the second day of the China Interna­tional Import Expo (CIIE) held in Shanghai. 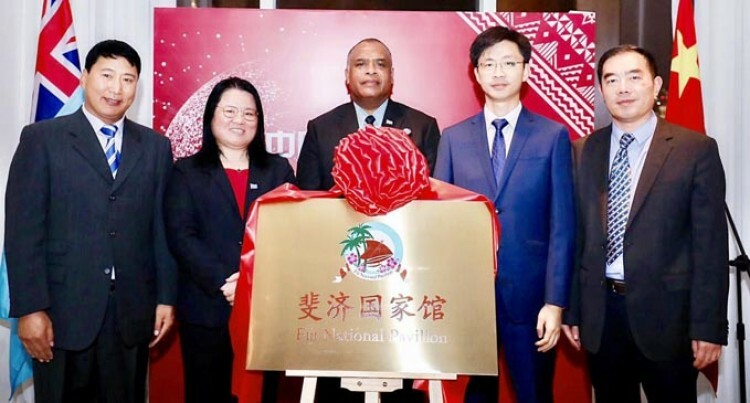 A statement released by the Fiji Consulate-General (FCG) in Shanghai states that hav­ing a permanent National Pavilion offers a very good platform to further advance Fi­jian trade interest in China. FCG also states they are now working in collaboration with Ministry of Industry Tourism and Trade together with other stakeholders in the setting up of permanent Fiji National Pavilion within the Shanghai Pilot Free Trade Zone. It is expected that the Pavilion would be operationalised from early next year. FCG states that apart from promoting Fi­jian goods and services at the CIIE, Fiji also makes use of this great opportunity to pro­mote brand Fiji through media interviews, fashion shows and cultural performances at central stage. Taking advantage of the CIIE, which will be an annual event in Shanghai and the world’s biggest import expo focusing on fa­cilitating foreign companies accessing the vast Chinese market. Present at the launch was Fiji’s Ambassa­dor to China, Manasa Tagicakibau, togeth­er with second secretary Amelia Cobona. They were supported by Olinda Chan, Fiji Consulate-General and Trade Commission­er to China, and her team who have been co­ordinating Fiji’s participation at the CIIE. Also present were the Fijian delegation consisted of senior officials from the Minis­try of Industry, Trade and Tourism (MITT), and Investment Fiji.